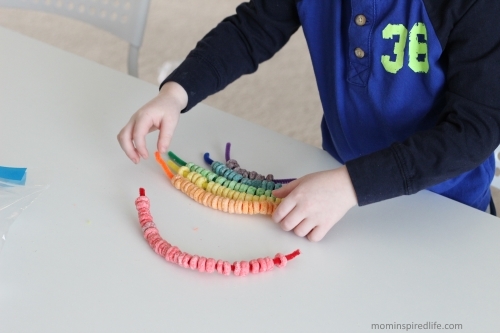 Making a Froot Loop rainbow is a great way to develop fine motor skills with kids in a fun way. 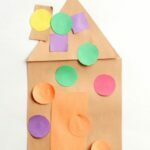 It also a great opportunity to practice putting things in order. 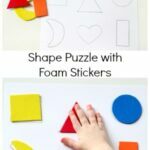 You can be sure it will turn into snack time too! 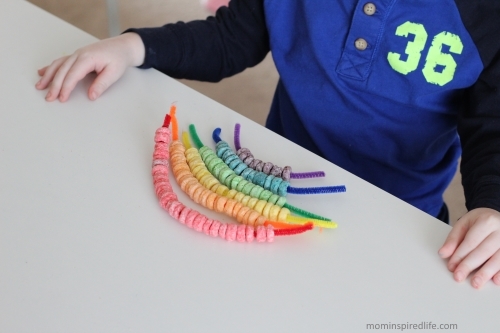 This simple threading activity is a neat way to make a rainbow. Evan isn’t a big fan of threading. 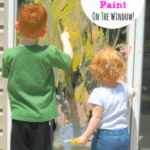 It gets bored with it very quickly. However, he did this for much longer than he normally does. It may have been that allowed him to eat some and he rarely gets sugary cereal. 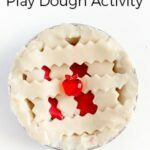 I am just glad he participated! Pour a bunch of Froot Loops on the table or in a bowl. 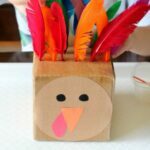 Place one pipe cleaner of each color on the table as well. 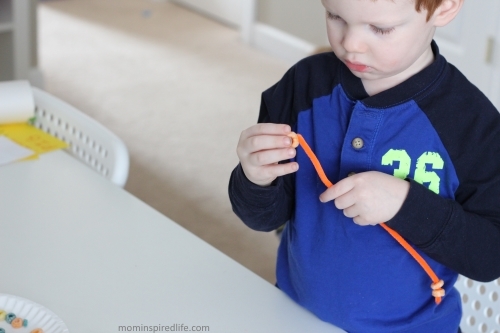 Have your child pick up the red pipe cleaner and begin threading red Froot Loops on it. 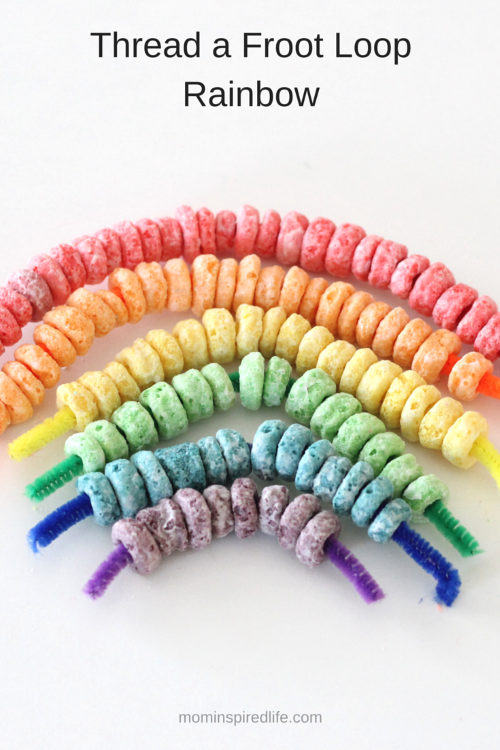 This will be the longest color on the rainbow, so they will need to fill almost the entire pipe cleaner with cereal. 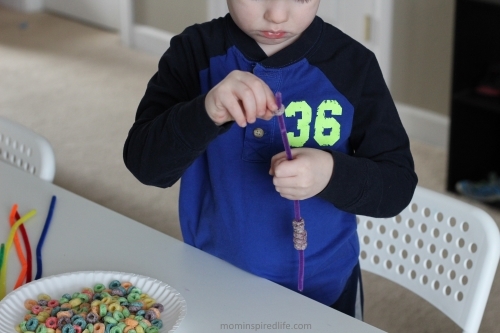 Continuing going in order from there and have them put a few less Froot Loops on the pipe cleaner for each color. The purple should only have a few pieces of cereal threaded on it. 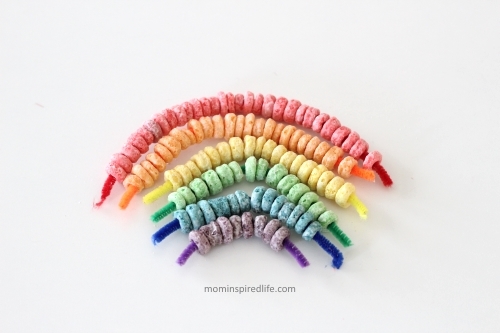 You can also just have your child thread each pipe cleaner with Froot Loops and not worry about forming a rainbow at the end like we did. 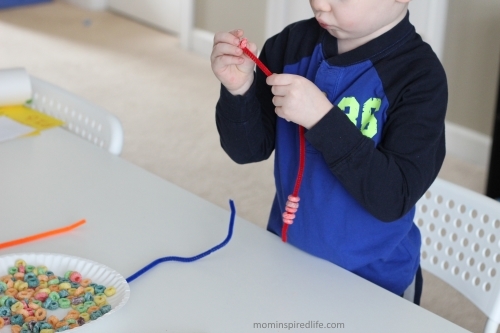 It would be a great busy activity for toddlers if you just had them thread the cereal on the pipe cleaners and not worry about the order or amount of cereal on each one.